Teacher. Don’t leave those kids alone. No more cribbing in the corridor, it’s time to sweat the big stuff. Because the interlocking challenges of our times, as we consider the future of humankind, are just complicated. A tangled mesh of consequences and cultures; conflicting parameters and pragmatic realities. It is beyond mind-boggling, our many-storied world machine. Which is a big part of the equation adding up to a lot of social indifference – on mass, we don’t engage much with the big stuff. It doesn’t connect to our personally complicated enough ordinary lives. I mean, you say you find long division a bit tricky. We have enough to cope with in our stuffed brains, and most of the stuff school tried to put in there we’ve forgotten. When it comes to daily stuff, we’re already sweating – if not in the office, or in the face of our kids’ homework schedules, then in the gym, trying to forget about the office and our kids’ homework schedules. But, of course, the big themes of our times always connect with our own little lives – they’re the context our lives are really happening in, and they can crash in on us at any time and reshape us dramatically. War, natural disaster, cultural clash – we’re always in a reaction against something that was nothing directly to do with us. And today, the themes of our times are the biggest imaginable, and threatening to change all our stati quo. How can we be mentally equipped to cope with all this? How can we be prepared? I think, if there’s one thing we’re going to need to be ready for the future, it’s imagination. How do we learn? And what can current global education systems teach us about ourselves? Just what do we elect to put into our children as their brains take shape and their personalities sponge up all their experiences and shape around them? What is the success we want for our young ones? And what kind of education are we all going to need to not just survive into the century, but sow seeds of long-term positive hope? “Ensure inclusive and equitable quality education and promote lifelong learning opportunities for all.” That’s the headline quote under the UN’s Global Goal for Quality Education. It sounds rather like the UN itself to me – delightfully bookish and worthy. But not exactly a street poetry slam. And, y’know. Who does love school? Well, it tends to be those who aren’t forced to go to it and face periodic tables and periodic knife crime. And the possibility of your first period happening in a classroom. For millions of people forced to go to state school over many generations, school has always been some combination of boring, stressful, uncomfortable, irrelevant and humiliating. And that’s before we even get to the pupils, poor little tykes. But, whether the staff doing the teaching are despotic blackboard rubber throwers that tried to knock some conformity into your dad, or inspiring PowerPoint dinosaur describers today, school’s chief lesson for most kids has always been a grade from the school of hard knocks. Above all it’s social boot camp. But perhaps that’s because many of us who grew up in broadly western education systems take it so much for granted we find it hard to see, or feel, the point of education – it seems in every sense, accademic. What it so abjectly often hasn’t been, is inspiring. 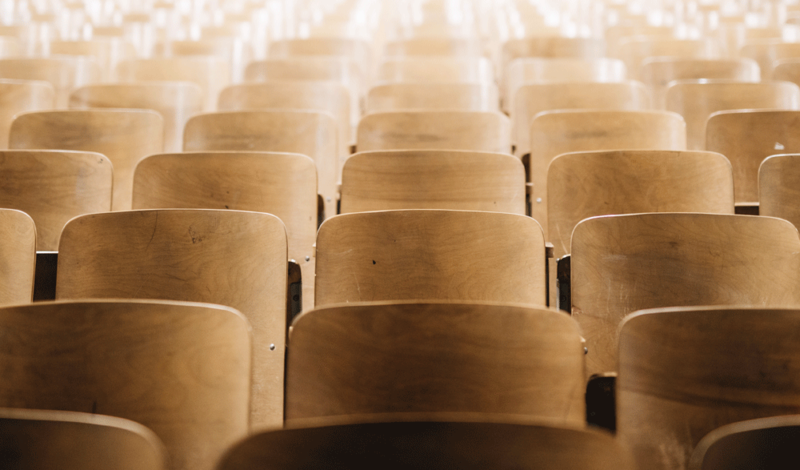 If you’re growing up in a culture that either doesn’t have reliable state education, or has an especially strong culture of promoting the equipping purpose of education, you might feel differently. You might even trott to school adorably. The more you think about how stuff connects, the more interesting it is, I find. So it would be good if school were always a place where this could light up childhood imaginations. But in any classroom, you are dealing with thirty, or ten, or two, or fifty different imaginations. And the teacher’s skill in conducting all this learning like a discordant orchestra – especially in music lessons – is affected by the pressures of time, funding and culture. And little bleeps who demand all the attention. The thing to remember is that every component part of the combined challenge we face today, everything the complete disaster plan for the future is designed to tackle – every single bit of the UN’s Global Goals – is tackling the fallout of human outlooks. Stuff coming out of our minds in our actions. So what we put into them is sleeee-ightly important. The complicated big stuff is never far away for ordinary lives everywhere. And it’s only going to get more complicated, the stuff we’ll need to know about. But if you’re truly going to get an education, the first reality to grasp, when thinking big, is of course that there is no such thing as an ordinary life at all. LOL – 404, man. 2m2h, txt = 2crz, yeah? DMNO, but WTAF IEU with that, right? I mean, DQMOT but is txt spk a sign of the end times? It’s easy to feel a 4NR to this and that’s because this relatively recent new language, born unbidden of daily human tech use, may simply have been the best ruse to date for young people to confuse their parents to their face. All the more because their parents might be desparing at this obvious collapse of educated civilisation. Or at least they would be, if they weren’t doing it themselves too. And that’s before we start using emojis. Shakespearian theatre actor Sir Patrick Stuart took the paycheque to bring to life the poo emoji in a feature film, that got funded apparently, last year. You know, that little coil of brown poo that smiles as we use it to efficiently denote something being a pile of stinking crap. ..So perhaps THIS is the turning point moment historians will use to illustrate to the inevitable decline of our modern human hopes. The moment we came, er, clean about not caring what we know or how we say it. Of course, while in your higher minded moments you are despairing at all this ignorance and general dumbing down of culture, you probably don’t know what emoji means. So here’s some useless information for you. The word is Japanese and means ‘pictogram’ or more more exactly e (絵, “picture”) + moji (文字, “character”). The first of their like was designed by Shigetaka Kurita in 1999, who took inspiration from weather symbols and Chinese characters and manga comics to inject a little simple play but cleverly efficient communication into the clunkiness of speaking through thumbs, while working with one of the big mobile coms companies in Japan at the time. Being Japanese, I’d guess he had a productive hunch it might go mad as an idea, sure enough taking off first in his native neck of the woods across phones and devices. But it went on rather quickly to become an interesting visual lingua franca globally. Except when we completely misinterpret them in different cultural contexts, as Cosmo amusingly spells out. That poo emoji means good luck in Japanese. Apparently. So lesson one on cultural exchanges: Always be sure where you’re flinging your poo. Don’t get emojis confused with emoticons, though, will you. Emoticons are faces made purely out of typographic symbols to hand on the western keyboard – :o). Which some coder somewhere has infected into the HTML bloodstream with an emoji tag for them. Which means I have lost count of the time I have confused correspondents when I imagine I am giving someone a little friendly sideways smileyface when I actually send them a little animated horrified shock face because I like to creatively add a lower case ‘o’ to my emoticon smiley as I think it looks cuter having a little round nose. It’s all the hell of now. The point here is that even the literally crappest of new things can get laced with nuanced cultural meaning fast when apportioned by humans. Because humans love using things in new ways and always lace everything with frankly sophisticated cultural nuance that you have to be able to contextualise to understand. And they especially love doing this when it’s playful, subversive and rude. We’re ridiculously brilliant as we fart and laugh and put off doing the job we’re supposed to be doing. We intuit and we pick up and we play and we reapportion and we reinvent for convenience and identity and a little easy money without even thinking. Everyone. All cultures, regardless of formal education. It’s just what humans do – we are natural learners, partly because we’re natural sharers. Civilisation really took off when we found our shared voices and began to codify the sounds for each other. From cuniform shopping lists to ASCII jokes, Egyptian hieroglyphic propaganda to becoming Oxford English Dictionary’s word of the year, we seem to have an instinct to keep adapting how we learn – because finding the right language seems to unlock our learning, amplifying our ability to pick things up by passing them on with cultural precision. Language is how knowledge gets spread in ever evolving diversifications across a multicultural human herd and so, over millennia, how we all learn. Being able to ‘stand on the shoulders of giants’ is precisely how humankind got to the moon. Wernher von Braun didn’t wake up in a field one day, and mid rabbit-bashing look up, dust off his animal skin and go sketch out the basis of the Saturn V rocket. He studied at the Technische Hochschule Berlin and joined the Spaceflight Society before getting his early work sponsored by the Nazis for invasive weaponry. See? Sharing is caring for us all in the end. When it comes to learning, it always becomes apparent that what we think we know is never as much as all the other stuff we had no idea we didn’t know. There are always very many more ways than one to skin an egg. You see? You were only thinking of boiling it. For one thing, as the lovely first lady of Momo has said often, everyone knows different things. Everyone seems to have a slightly preferred way of doing the learning too, for it to stick. Finding the preferred personal language. Teachers of various kinds these days often believe that children and adults learn through different methods of perception – y’know, your VARKs: Visual, Auditory, Reading, Kinesthetic. Some of us like to picture things for it to go in, some of us like to just listen, some of us like to read privately and some of us prefer to interpret complex mathematical formulae in short dance stories. So the thinking goes. Yet in education, behind all the worthy encouragement of individual young minds we hear about from junior education ministers and private school brochures, in cultural practice we have been used to very simplistic ideas of ‘stupid’ and ‘clever’. Which isn’t very clever. Because the cornerstone of traditional education is the ability to recall information – and that depends on being able to read and rub along with the specific language of text books and boffins and dusty old English teachers. Reciting times tables, quoting Shakespeare, remembering the date of the Battle of Bosworth Field. The idea being that if that stuff is drummed in there – beaten in there, nagged in there, scolded in there, humiliated in there – you will always have such mental knowledge abuse scars with you to hand. And so you’ll be equipped. To become another teacher, mainly, and take it all out on the next generation. It was a venerated profession once. Of course, this rests heavily on the usefulness of what is drummed into your brain. Basic wildlife tracking and firestarting will be of more interesting and practical-seeming use in your recall memory if you have to camp in the middle of Bosworth Field, for example. Much more than remembering how the reign of the Tudors started in 1485, actually a couple of miles from Bosworth, and King Richard III ended up in a car park in Leicester. All very interesting round the campfire, but not as useful as knowing to dig a latrine downwind. This rote learning and its extended culture can lead to people carrying pyschological hinderances to further learning, of course. It’s one thing to learn lines for a play, or to put in your ten thousand hours of practice to master the classical guitar and woo Argentinian dancers with half a chance, but judging a person’s aptitude for life on their aptitude for processing abstract symbols on a page is not very enlightened. I can’t even remember how many of my creative friends are one kind of dyslexic or other, and many of them my age and older still consider themselves bad at writing and articulating themselves when actually they are wordily some of the richest expressers I know. Daft, right? Stigma of classrooms. And anyway, after all this, beyond the Information Age what exactly will be the purpose of emptily reciting knowledge? As vital to unlocking learning as reading is considered, more and more users of interfaces the world over will be able to access information without having to so much, thanks to the rise of voice assistants and iconographic navigation – when you don’t get your emojis culturally mixed up, or the legs of your Lack IKEA sidetable on upside down. And however you want to access that information, the point is that you can. We live in a time where we can can cheat in pub quizzes eternally – ask a question of simple fact and your phone will tell you. Richard eschewed the horse, he didn’t monologue for one. Yet, essentially, are our schools still teaching our kids to pretend to be English scollars? But. Before you go looking for the link for your kids’ Code Club, it’s worth trying to get a picture of just where the world is generally with education. To engage with the world’s possibilities, like its challenges, essential literacy is still the gateway to greater global opportunity. And to limbering up for learning that utterly superhuman organ, your daft brain. How are we collectively doing at enabling youngsters to read and write? The UN thinks that we need to be finding ways to globally provide free education to primary and secondary levels, boys and girls equally. Half the challenge there is indeed equality. UNESCO published figures for the middle of the decade that had over 260million children out of school worldwide, which does actually represent an encouragingly steadily decreasing number this century – and one that saw a significant closing of the gender gap to almost parity between the sexes. But such average figures mask a still significant gender imbalance, they say. They state simply that child marriage is driven by an always local mix of gender inequality, poverty, tradition, and insecurity, and it happens all over the world, of course. As the World Bank says, child marriage happens to boys and girls, but overwhelmingly it’s girls that are affected most. They suggest it’s on the decline almost everywhere, from especially high figures in places like Bangladesh and a spread of African nations. But it’s still on the increase, they claim, in Niger above everywhere, but also in Mali and the DRC. It’s far from going away, and they think that of all girls having children under the age of 18, three-quarters of them will be child brides. Laura Paddison wrote up a little summary of a Guardian round table on the issue, driven by the belief across all the major health agencies that getting girls more equally into education is the key to really leveling up national economic inequalities. And it’s more than just under age marriage that reduces the effectiveness of girls’ educations more than boys. Making the environment comfortable for them is a biggie. From the simple sounding but statistically significant effect of shame and menstruation in many places girls are growing up, actual safety is too often a challenge. As Nora Fyles Director of the Secretariat for the United Nations Girls’ Education Initiative put it: “Gender-based violence in and around school is a reality. [Girls] don’t think about learning when they’re trying to figure out what the next exit is or whether they can go to the toilet and be safe.” As Paddison says: “The international education sector has spent so long trying to get children into school, especially in the developing world, only to realise girls are facing dangers there”. But it’s not like boys are thriving at school. You might have observed a generalism that girls seem more earnestly swotty on average than the boys mucking about at the back of the classroom. But it’s just this sort of oddly universal background view of the genders that often impedes them. From the engagement of the classroom itself for them, to the both legal requirement and cultural expectations of attending school, boys are likely to just not stick at it. What is it across human cultures today that doesn’t equip boys to engage with their own educational, mental and emotional wellbeing? Because millions of boys growing into men seem to come to all this later in life, and often the hard way. And back in one of the earliest chapters of their lives there is the classroom. Or at least, a perception of it. Hmm. Because some of these education themes, that seem clear to foreigners parachuting in to developing nations, really don’t sound so disconnected from school students of the richer countries of the world, actually. Engagement is… not what it should be. So, whoever you are, wherever you are trying to learn some skills to make sense and opportunity out of the world around you as you grow up, what is school doing for you? She barely blinked. “It’s sh**” she said. Unsurprised totally – which says something itself – I asked why. Target culture. That’s the whole end effect of the current national curriculum it seems, here in my home country. And as my chum added: “It’s not even a level playing field for schools, because we have to compete with much bigger, much better funded schools with kids who come from much more stable homes”. What happened to the classroom? But was it ever so much about education anyway, I am tempted to ask. When you start looking about, there are lots of people saying education the world over isn’t good enough. Isn’t working effectively enough. There seem to be patterns. But the world is going to simply need more trained teachers. “Globally, there are more trained teachers and fewer students per teacher, which is important to improve the quality of education. But a high population growth, especially in sub-Saharan Africa, will result in higher numbers of children in school, and thus a need for more teachers” they say. And they show that numbers of adults leading classrooms in some of these countries have been going down. Then there is simply the fact that education Official Development Assistance – charity cash – has been going down for some years, where, they claim, other aid sectors like health or infrastructure continues to gain funding support. And at the same time as developing nations have been slow to up their own spend on it. GPE ask their partner countries to aim for at least 20% of their national budgets to go to education for it to be effective. It is interesting to ponder here how we value education. And the educators. Judging by my primary school teaching chum’s feelings, and those of many people I know well in the sector, they don’t exactly feel valued or empowered. And this sometimes even feels social – because, let’s face it, when a bunch of teachers get together, the rest of us back away. They have LOTS to talk about that… (I’m going to say it…) always sounds a leeetle obsessively inward-looking. ..Sometimes. But that’s because half of them are probably dealing with PTSD. And the rest of us wouldn’t quite understand. And anyway, a school is a whole world in itself and it’s even more socially immersive than trying to start up a business. What boss obsesses over their staff like a primary school teacher does over their kids? The question remains: Why aren’t we all a lot more inspired by general education? Kids and adults alike? Maybe the word general I put there without thinking is a bit of a clue. Education doesn’t feel very personal. And there we pause our look at Education, to give you time to go run around in the playground before the next period. Play hand tennis. Hopscotch. Hoop and stick. Rooftop parcour – whatever it is you kids do in breaktime these days. Next time on Unsee The Future, we’ll look at robots in the classroom, essential planet design and try to picture what Hopey-Changey School might look like.